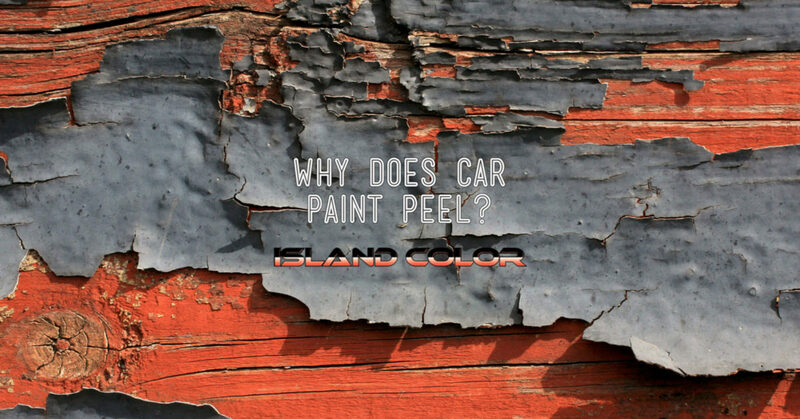 Why Does Car Paint Peel? Island Detail and Color is the intersection of Your Car, Your Passion, and Your Pride. Whether your vehicle is a sporty coupe or a capable off-roader, a beautiful paint job is a mark of pride and a cause for admiration. On the other hand, a neglected or deteriorating paint job will cause the value of your vehicle to be far less than its potential. Peeling paint is one of the worst problems that face modern vehicles, as peeling paint looks terrible and exposes more structural components of your vehicle to corrosion and damage. Here are the common causes of automotive paint peeling. Certain car models tend to experience paint peeling more than other vehicles. This is usually because a batch of vehicles wasn’t prepared properly to accept the coat of paint. Before a coat of paint can be applied, the metal of the body panels needs to be treated with a primer. The primer’s job is to stick to the metal and give the paint something to stick to. If the primer is not done correctly, or is of poor quality, the paint doesn’t have a chance to adhere properly. The only solution to this problem is to strip off the old paint and repaint the entire exterior of the vehicle. No matter how careful you are, a rock or bit of flying debris can easily hit your vehicle and cause a chip or deep scratch. If the damage isn’t fixed quickly, the paint will start to deteriorate. Modern cars are all treated with a clear coat before they leave the factory. The clear coat protects the actual pigmented paint, which is quite fragile. If the clearcoat is damaged and not repaired quickly, dirt and moisture will build up underneath the finish. This means that the damage will get worse over time, and eventually, you will see large pieces of paint flake and peel away. In worst case scenarios, this will result in rust. Don’t let peeling paint ruin the curb appeal of your vehicle. Get in touch with us at Island Colour and we will help get your vehicle back into showroom condition.